This residential building, known as ‘The Lock’, is situated in the centre of Manchester standing adjacent to one of its many canals, providing high end luxury living. The di cult conditions on this former hydraulic power station site led to a challenging design solution of bored cast insitu concrete pile groups, socketed into the rock to sustain loads imposed from the 11 storey building. A secant piled retaining wall, along the canal provides a practical solution to the elevated position of the canal. The two parallel blocks of accommodation consist of cellular insitu reinforced concrete about the central atrium. A system of full storey height deep beams form the party walls, dictating the structural grid and demarcating apartments. These walls conveniently arch onto double storey height columns, enabling efficient car parking within the basement and ground floor storeys. Access to the apartments is by way of suspended precast concrete walkways. 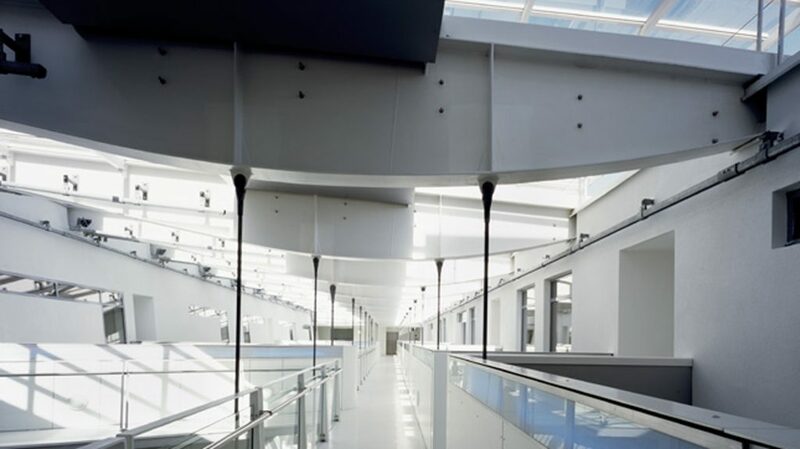 The systems of tension rod assemblies and socket connections are hung from plated feature beams, exposed to such an extent to express their teardrop formation and pin connections, resulting in a major contribution to the visual aspect of the atrium.